The most generally accepted theory about starting eBay bids is that setting the bidding too high scares away new bids. But again, the variable is based on how much the item is worth or even how much it costs. Some sellers begin the bidding at the price they paid for the item, including known eBay and PayPal fees, thereby protecting their investment. This is a good tactic, especially if you bought the item at a price far below the current going rate on eBay. To determine the current going value for your item, you might try searching for the item through the sold listings. If you know that the item is selling on eBay for a certain price and that there is a demand for it, starting the bidding at a reasonably low level can be a great way to increase bidding and attract prospective bidders to view your auction. Years of advertising experience can’t be wrong. If your item is in demand and people are actively buying, start the bidding low. Retail stores have done this for years with ads that feature prices starting at $9.99 or $14.98. Note that Wal-Mart ends prices in $.97 or $.54 when they’re on sale in a store, but on its website, the items’ prices end evenly at $.00. When sellers know that they have an item that will sell, they often begin their bidding as low as 99 cents. Because of the eBay proxy bidding system (which maintains your highest bid as a secret, increasing it incrementally when you’re bid against), it takes more bids (due to the smaller bidding increments) to bring the item up to the final selling price. The downside is that new bidders who aren’t familiar with the system may bid only the minimum required increment each time. This can be frustrating, and they may quit bidding because it might take them several bids to top the current bid placed by someone who is familiar with the proxy bid system. 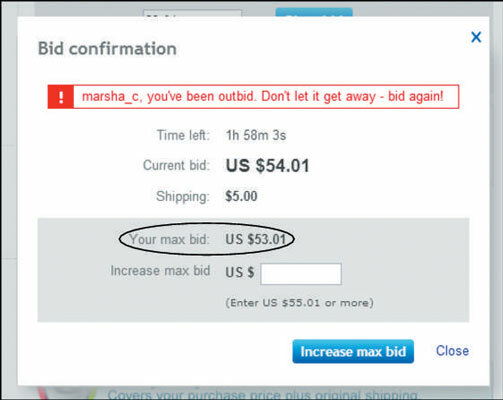 eBay offers a tip when the bidder places a bid that doesn’t meet the current bid.